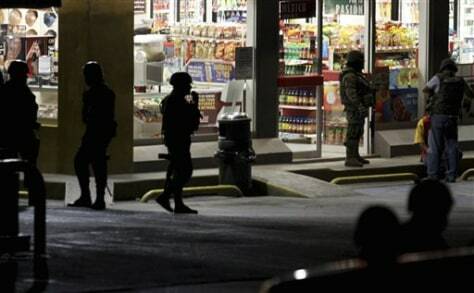 Mexican authorities guard an area after a shoot-out occurred between unknown gunmen and the army on the outskirts of Monterrey, Mexico, on Oct. 14. Monterrey's swift downfall into violence lays bare issues that plague all of Mexico: A lack of credible policing and a history of looking the other way at the drug trade as long as it was orderly and peaceful. Now the government is trying to win back what was once Mexico's city of the future.